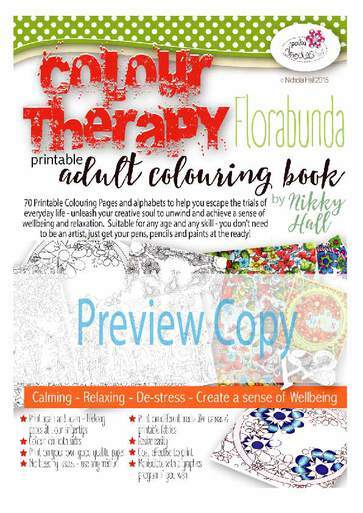 Have you seen the lovely new Colouring books yet? The winner of this challenge will receive a $10 voucher for the store! You can make anything you like for the challenge, as long as it follows the theme. You do not need to use Polkadoodles products to enter our challenges. Ruth: I've used papers from the Twiggy and Toots cd to make a larger than life special 21st Birthday card. Lots of bling and sparkle around the edges of the numbers. Really quick and easy to make - the hardest bit was waiting for the glitter to dry! Naz - The image I have used on my project is Serenity Stardust part of the Serenity Fairy Wishes Bundle which is one of my all times favourite collections from Polkadoodles. 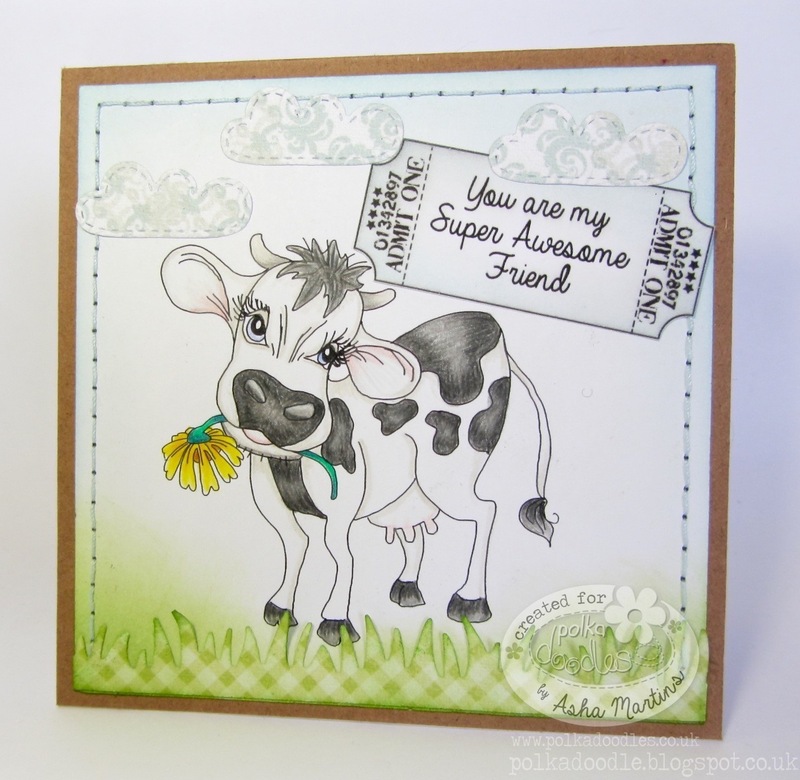 This Bundle included black and white as well as coloured digital stamps, beautiful papers and sentiments. The sentiment I have used for this project is from Polkadoodles Work and Play 10 - Country Life. 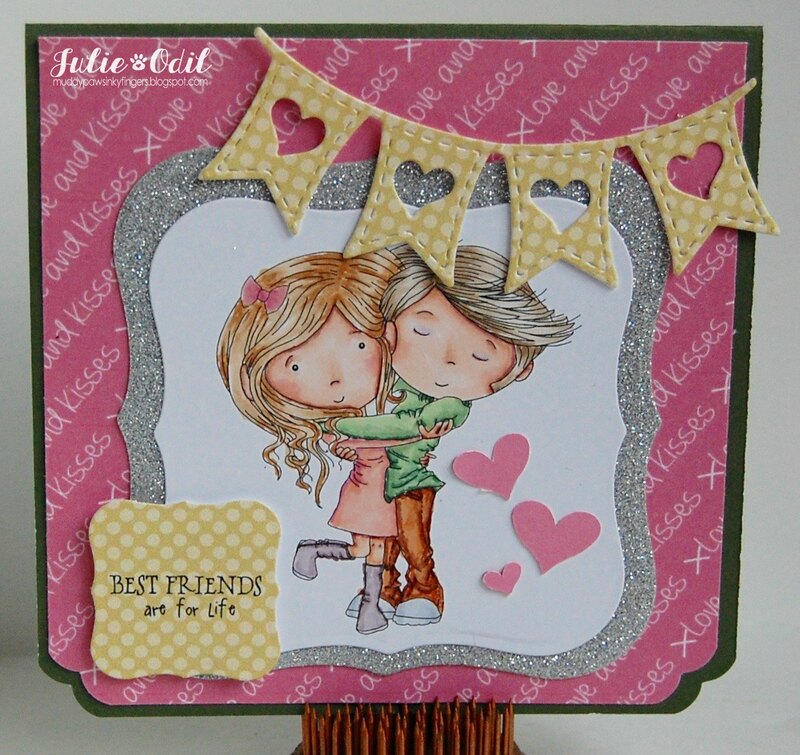 Julie -- I used the adorable Work & Play 9 -- Love & Kisses Collection this week, creating an anniversary card for my husband. I didn't want too much bling or glitter, so I used some glitter paper to back the image. 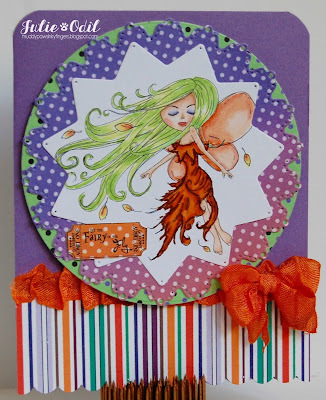 Anjie - I have used the Serenity Fairy Wishes collection to make this card. You can buy the image Serenity Resting on her own HERE if you would just like that. 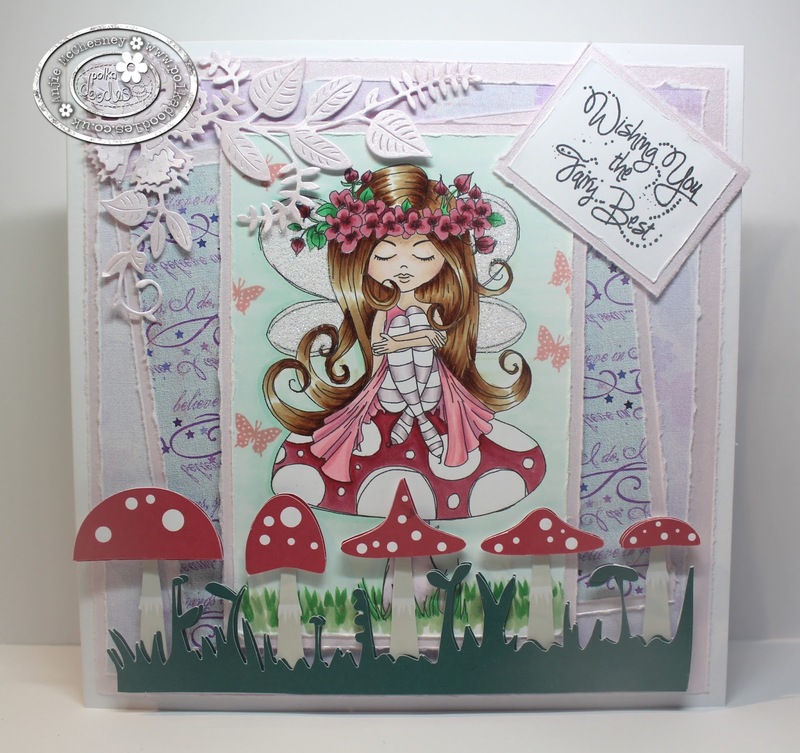 The fabulous Toadstool border has been cut using my cameo and the cutting file can be found HERE, isn't it just perfect for this image!!!!! For the challenge I have added superfine glitter to her wings which you can see better in the close up image on my blog, along with the rest of the details. Bev here with my inspiration for this sparkly challenge. 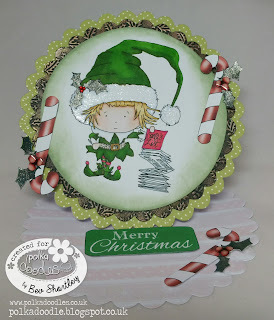 I'm gradually getting my Christmas cards done and this week I used the fabulous Work & Play 5. and coloured the gorgeous little elf with my graph'its. More details on my blog. 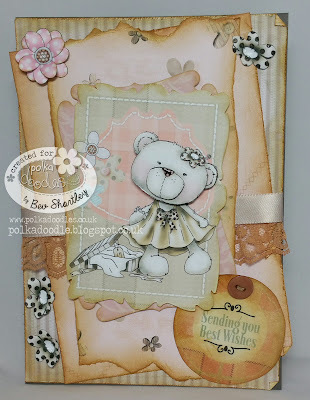 Penny here using the beautiful Hollybobs collection and the image Presents. Im finally getting some cards ready for Christmas. I dug into my stash of glitter card stock and layered up lots of different colours to add some bling. I wanted to keep the image as the focus of the card so she would pop. It was so nice to get copics onto card stock again. Its hard to see in the photo but the berry's are glittered with glossy on top just for that added pop. Please contact us HERE and quote PD44001Wk41 to claim your prize. 'Tis Friday, well it is! Can only mean one thing - another week has gone by in the blink of an eye. What's New section of the Polkadoodles Store. Something totally awesome is waiting in the NEW section!! eeeek! We are SO excited!!! Ok now let's take a look at the Design Team inspiration for you. Scatty Jan - For my card I have used the fantastic template from Twiggy and Toots collection I then used the uber cute little robin from Frosted Winter Collection. Also from that collection came the paper, and all the other elements. I cut some snow from white paper and glittered it up to finish. Jackie - For my card this week I have continued to make good use of the brilliant collection of digi images in the Work and Play 5- Festive Hollybobs collection. It can be purchased as a cd or as a download and of course the digis can be purchased individually. The image here is Hollybobs Mistletoe Kiss. Details are on my blog. Asha - I made a centre step card with image, paper and digital embellishments from the Angelberry Christmas CD. I coloured the Angel with Faber Castell Polychromos. You can also purchase the image as a separate download here - Angelberry Pressies. For that festive sparkle, I added bling, Stickles and sequins. Jenny - For my card for the add some sparkle challenge is a big one! I used my Cameo to cut out the cards and it ended up with eight panels but I couldn't get them all on one picture. I edged all the pictures with glitter and also added glitter to the holly in the corners. 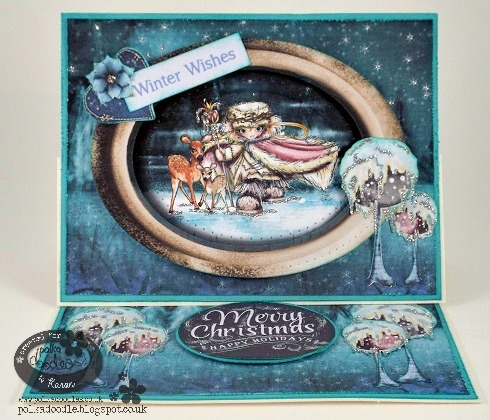 The images are all from the Octavia Frosted Winter Collection and I used the coloured ones for this. Jessie - This challenge really stumped me, I use lots of basic things but glitter bling and all that is not a regular occurrence for me. So I started by blowing Odella with Bag up to fit a 5 1/4" x 3 7/8" panel to cover the entire front of my card, then I coloured her up with my Copic Markers. I decided that for my sparkle I would add some Wink of Stella in clear to the heart on her cheek as well as on her shirt (that is what the tiny white spots actually are.) 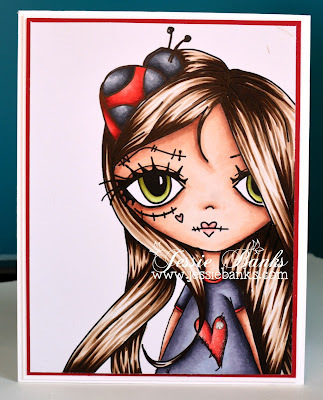 Then when I finished that and matted it all and got the card built I remembered that Wink of Stella does not photograph well so I took one adhesive back rhinestone and adhered it to the heart on her shirt. 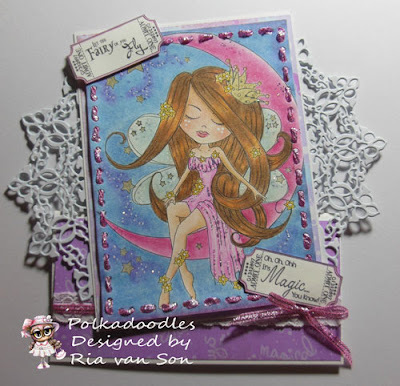 Ria - For our Sparkle, Bling or Glitter challenge I choose this card with the pretty Serenity Stardust from the Serenity Collection. I coloured her with Pencils and added glitter(stickles) and I used my lovely glittery ribbon so love this I will cry my eyes out when it is all gone ;) hahaa well I hope you all join us . Wendy - For my glitter card, I've used one of the design sheets from Octavia Frosted Winter. I love these design sheets, they all have enough elements for at least 2-3 cards on a single sheet! 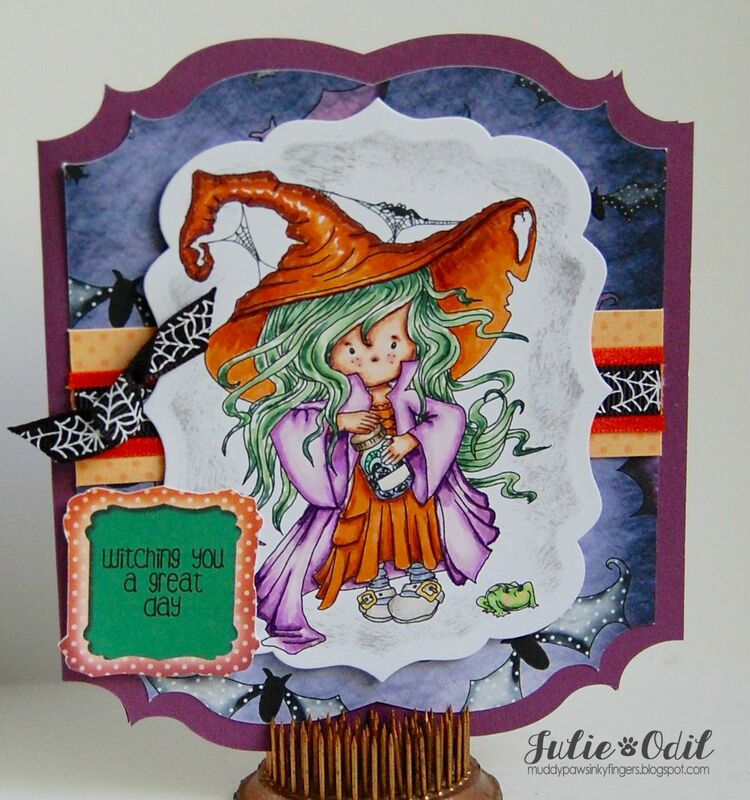 I've teamed with some glittery pink card, lots and lots of Stickles and just a few Aurora Borealis stick on gems. Sparkle a plenty! WOW - that should get you all inspired. So off you go and craft something amazing. You have until Noon, GMT, Friday 6th November to enter. Please remember only 2 entries per person. Bloomin' eck it's Friday again! That can only mean one thing, time for us to share some Design Team inspiration with you all. The winners of our Favourite Card Shape challenge will be at the end of this post. Before we get on to seeing what the Design Team have been up to, let's see what's in the store. and download collections to be had. No hanging about for that pesky postman either. Asha - Instead of using die cuts to frame or mat, I've decided to create a scene with die cut clouds and grass with papers from W&P 10 Country Life. The star of the card is a sweet little cow from W&P 10 Country Life. I coloured her with my pencils, adhered a ticket tag the CD, inked the edges and my CAS card is done. 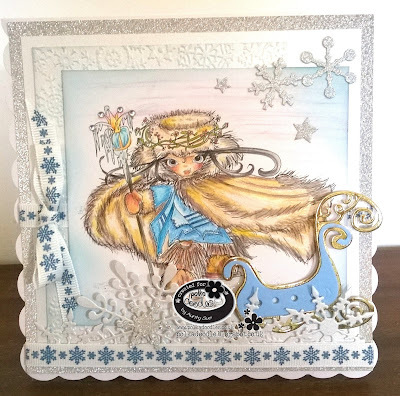 Scatty Jan - I have used the amazing Frosted Winter collection using the lovely Artic Wandering Star Octavia also available as a digi here and also the Ice Palace which is available here. I coloured up using Graph'It Markers and also using the silver shake it marker, I cut some flowers from the collection and coloured them up to match. I cut around the bauble using a die. Jackie - I have been busy colouring up some of the great digis on Work and Play 5- Festive Hollybobs. This one is Hollybobs Skating Fun. The paper, sentiment and bow are also from this collection. I have used a Sizzlits die set for the snowflakes. Details on my blog. Karon - I have made an easel card this week. Using a pre-coloured digi with frame from the fabulous Octavia Frosted Winter collection. She is also available as a black and white image for you to download and colour HERE. 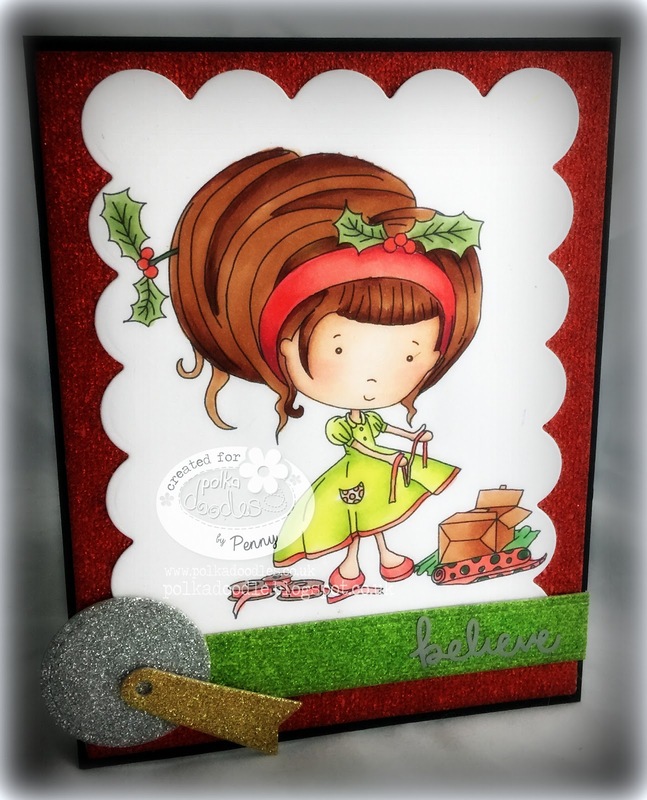 I add some glitter and used my oval dies, to cut around the frames and sentiment. Everything you see is from this fabulous collection. 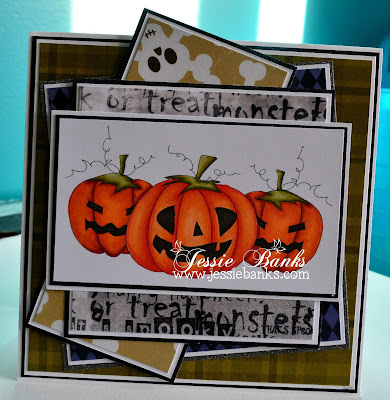 Jenny - I have used a large die this week to cut the window on my card. 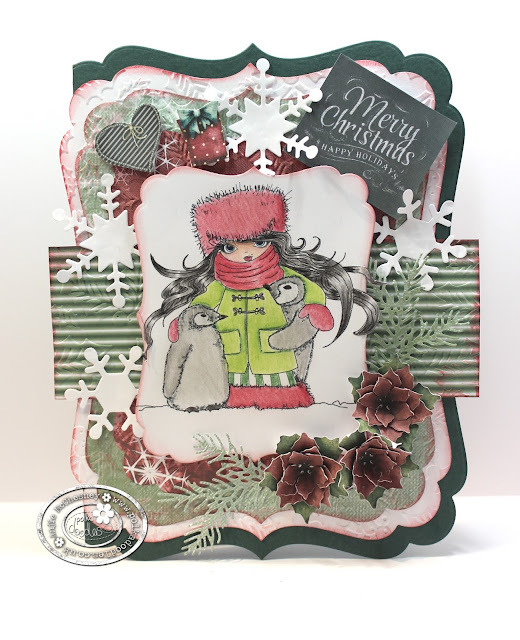 I have used craft card and one of the pre-coloured digi's from the Octavia Frosted Winter collection. I wanted it to look like you were looking out onto a snowy scene, although I've used the coloured image you can get her on her own as a digi download here. 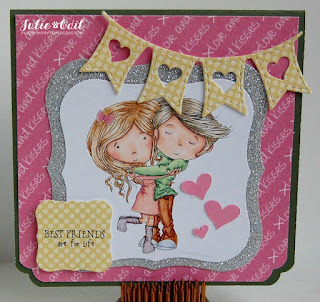 Jessie - I love tucking small die cuts and things in as layers on my cards and the banner on this is a great example of that! I used the Octavia Big Kahunna bundle for this card. the paper and the image all come from that collection! This image is so worth all the time put into colouring it! Aunty Sue - Wow how do I follow all this inspiration well hopefully this wont scare you away. I have used the Autumn/Fall Digi stamps with this brilliant Guy doesn't he look like he is ready for another drink and also the papers are from the Paper Heaven download 1 and the house and sentiment is from the sentiments pack all available from the shop HERE. My Dies are the corner die and the Railing in front of the house. The image has been coloured with my Lyra Rembrandt Polycolor Pencils. I do hope that he hasn't scared you off from joining us this week. Wendy - For this weeks card, I've used a sentiment from the Picnix 3 Collection as the main focus and re-coloured in using Craft Artist. The Poinsettia's are also from the same collection. The die is a Tonic verso die, 'Birthday Wishes'. WOW what fabulous Inspiration. has it put you in the mood for crafting?! You have one a $10 gift certificate to the Polkadoodles download store. Please contact us HERE and quote PD42001Wk39 to claim your prize. Don't forget to get you badges from the side bar. in our challenges, we love coming to visit all your fabulous blogs. Ruth: I've made a tee-pee card for a work colleague who will shortly be going on maternity leave and its big enough for all the office to sign. 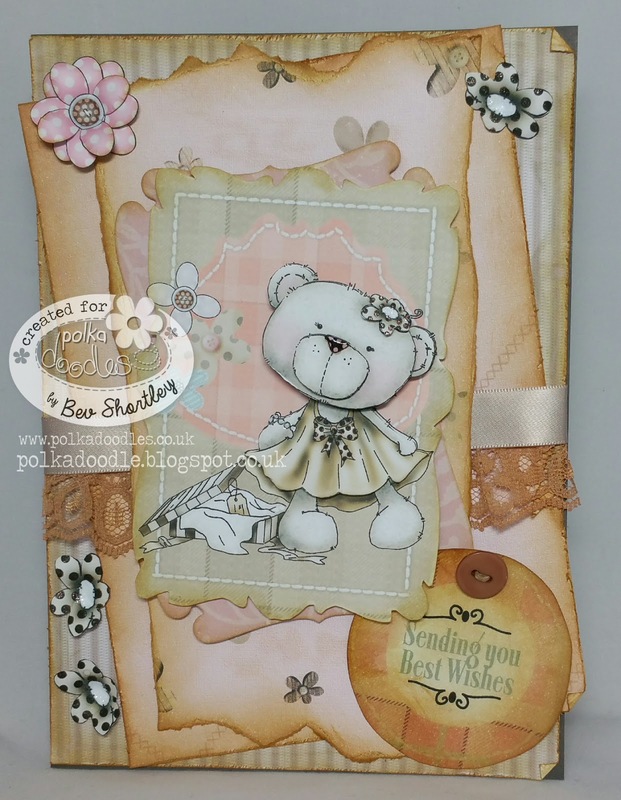 Papers are from the Twiggy and Toots CD and I've used a Sizzix die for the cute elephant and a Spellbinder frame. Naz - The stamp I have used for this project is called " Serenity EarthStar" and it is part of Serenity Fairy Wishes Bundle. 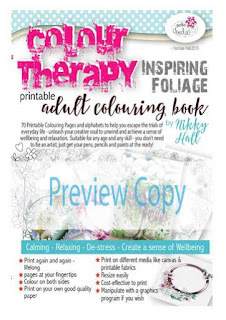 This beautiful Collection is and Amazing Value and includes stunning Digital Stamps both coloured and black and white, papers as well as sentiments. Anjie - The image, papers and embellies are all from the Octavia Frosted Winter collection which is available as a digital download or CD, or you can even buy all the elements separately. The image is coloured with my Grpah'It Markers as is the background. 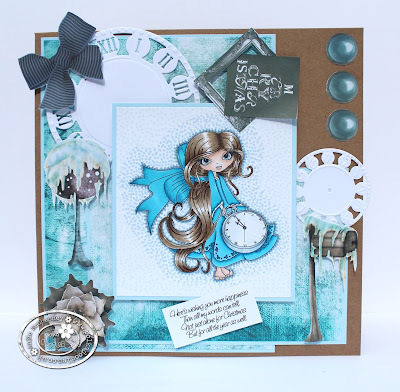 For my die cuts I have used the clock dies from Marianne. More details and photos on my blog. Julie I used an image from the Serenity Fairy Wishes Digital Download Collection. This is Serenity Earthstar, available individually here. 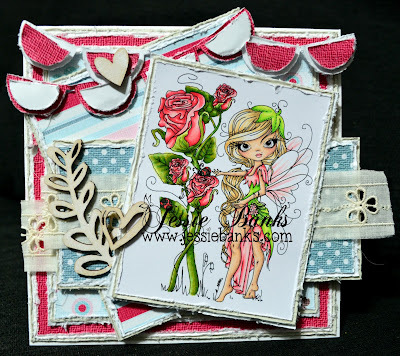 The sentiment ticket is from the same Serenity Fairy Wishes Collection. 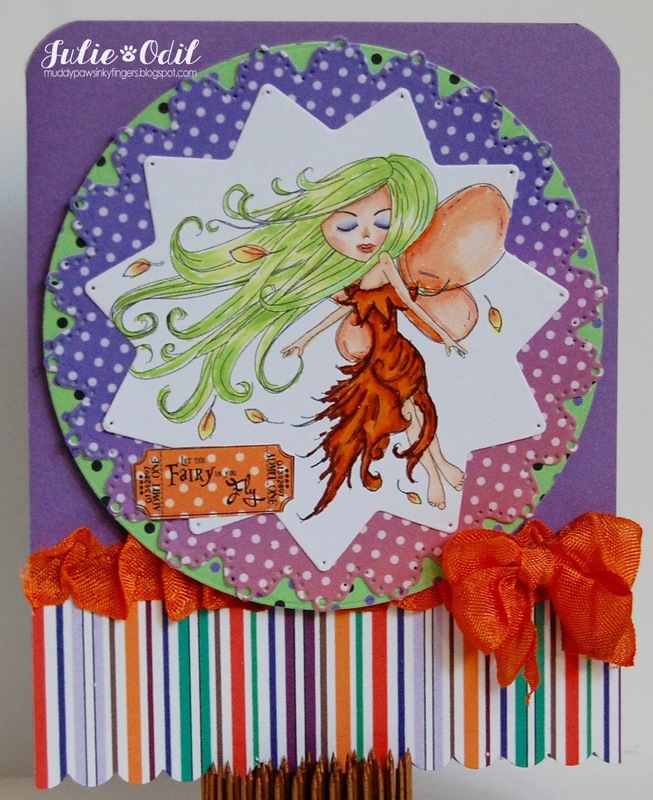 Since I wanted a Fall Fairy, I used papers from the Witchie Witchie 2013 Craft Download Bundle. Of course, I used dies on this. There are 3 of them, used to showcase the image. Bev here with the oh so cute Etty she's on the fab Winston Collection, I used one of the design sets with a few different backing papers, some ink, glitter, ribbon & lace. You may have to look hard as my die cut is one of my layers Can't wait to see what you guys come up with. Claire C I've used lots of elements from the gorgeous Picknix Nordic Winter Collection (you can find it here) to create this acetate card. I don't use a lot of die cuts in my crafting but I've dusted off my cuttlebug and added some die cut icicles to the top of my card. To save time I've used pre-coloured elements from the collection, isn't the snowman adorable? 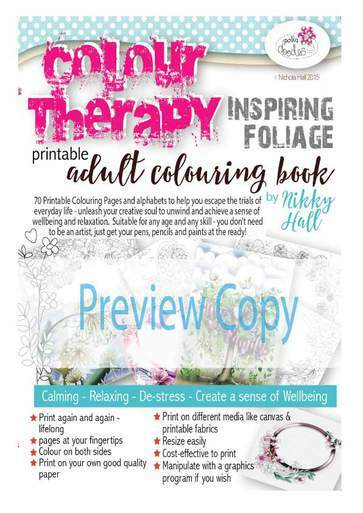 Penny here, this week was all about me putting colour to paper and using an image I wouldn't normally use. 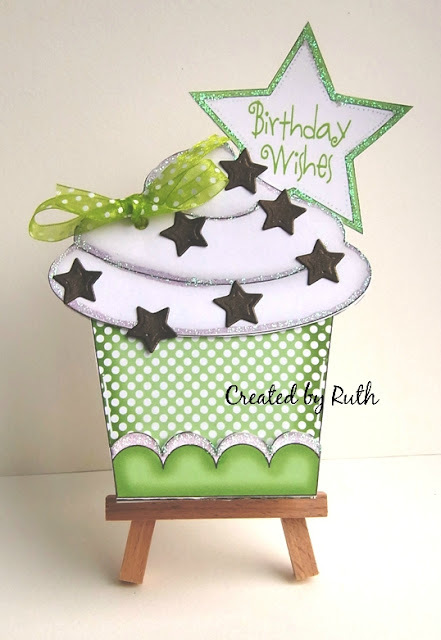 I grabbed my kits and found this lovely Cupcake from Picknik 1, combined with some patterned papers from Work and Play 3, and Work and Play 4. Clean and simple and the image was made to pop! My dies are in the matting, circle and banners. to take a look at your wonderful creations. Remember only 2 entries per person please. You have until Noon, GMT, Friday,8th October to enter. Now lets take a look at the fabulous creations from our Design Team. 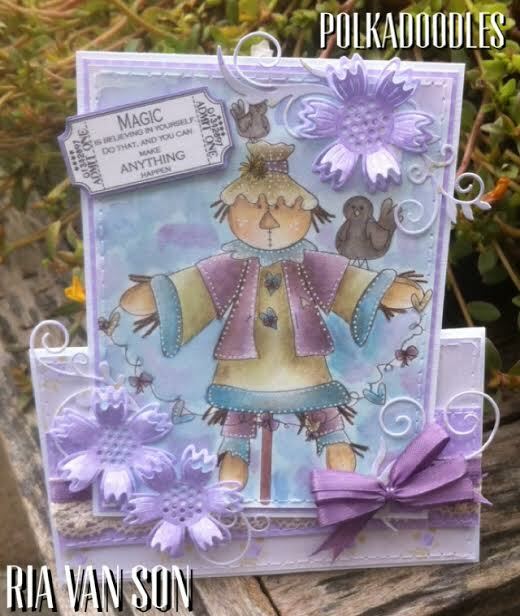 Ruth: I LOVE using Paper Boutique Vol 3 because it makes card making so easy and I produce stunning results! 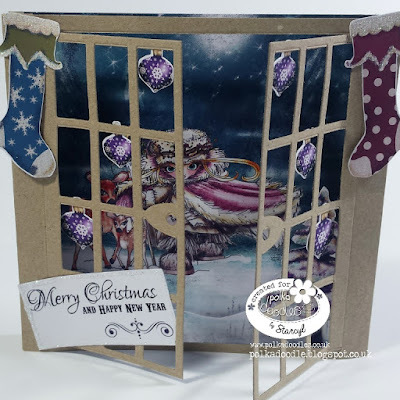 This has to be my favourite card shape - really easy to make, print all the elements out A5 size, cut out, layer up with foam pads and add glitter where required! 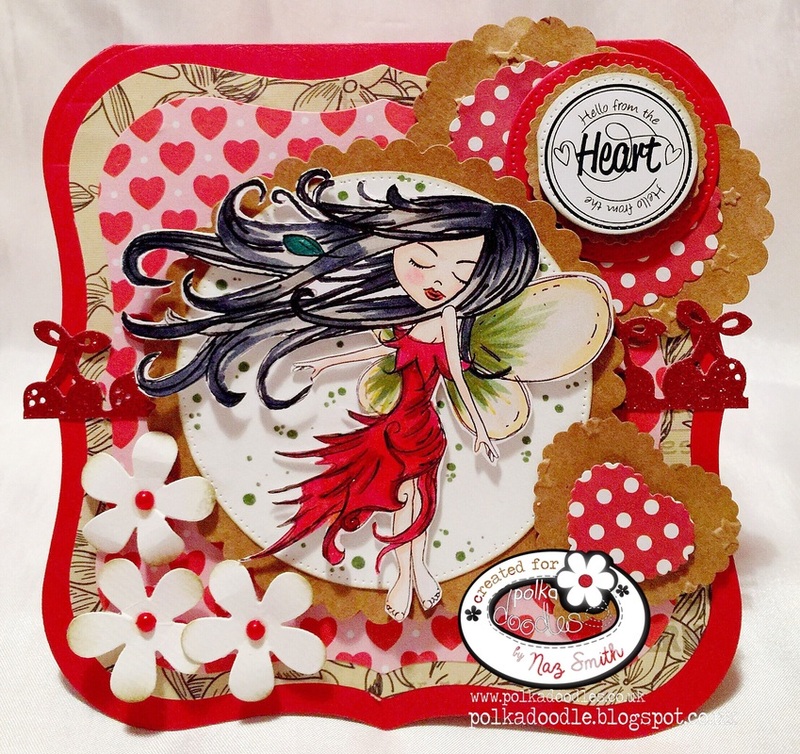 Naz - This is my card for Favourite Card Shape Challenge. The image I have used here is from Twiggy and Toots Festive Fun Collection. 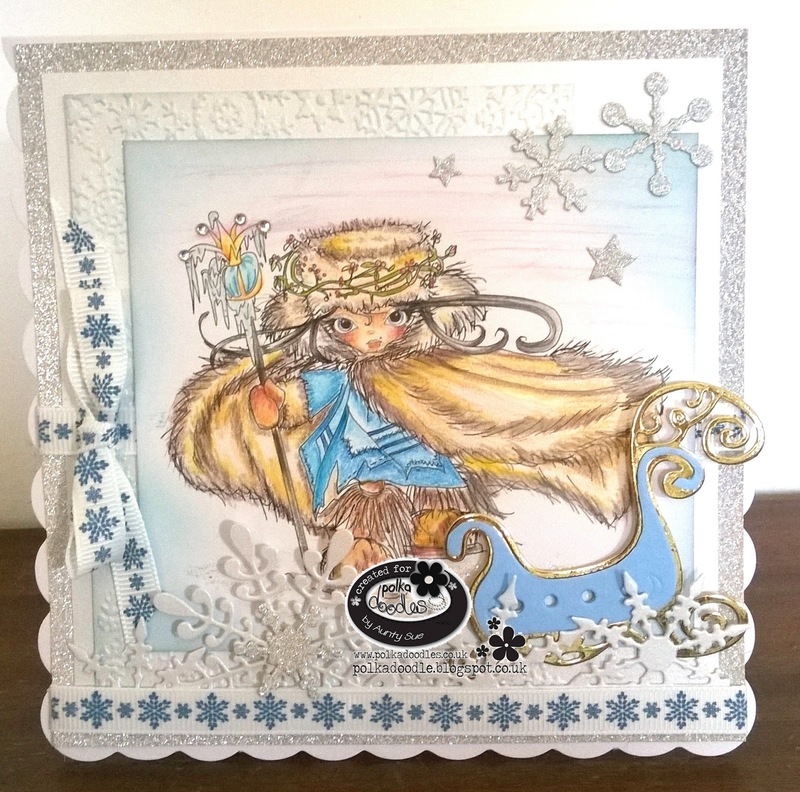 I made an easel card and used lots of die cuts and pearls for embellishment. The sentiment I have used is also from Polkadoodles. Anjie - The image, papers, embellies and sentiment are all from the Octavia Frosted Winter collection, you can buy the image, Frosty Penguins, on it's own HERE. I have coloured the image with Lyra Rembrant pencils. More details on my blog. Bev here with an easel card for you. I've incorporated quite a few things this week. 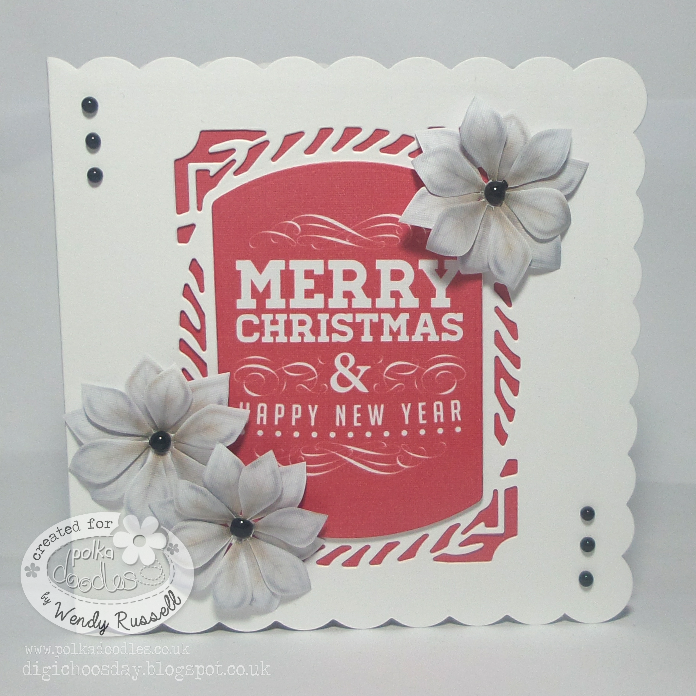 Including Oddella Twig and papers from Octavia, the cute little ticket sentiment is from Sugarplum Daisy. I've left the stopper plain at the moment to personalise at a later date. More details on my blog. Penny here with my favourite shaped card. I originally was leaning to a circular card when it struck me that my real favourite card is actually a tag. I ended up printing out lots of elements and then combined my two favourite shapes into one. The yellow spotty background is from Work and Play 1 and then the wonderful Twiggy image is from the Twiggy Festive digital download. I do love how you can mix and match kits, especially if you are like me and you can't make up your mind on what your theme is :). 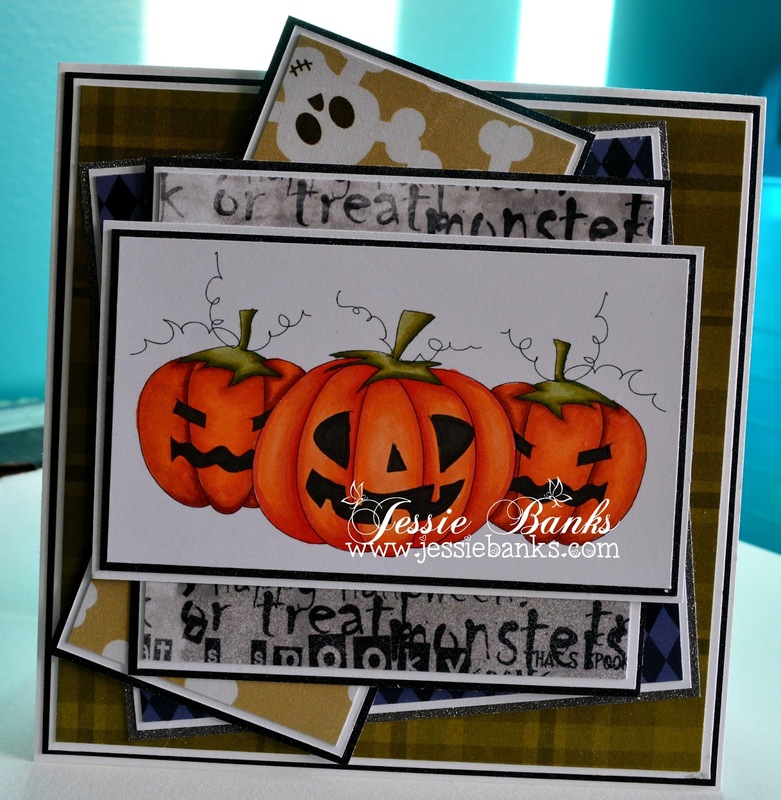 Jessie - My favorite card shape is one I resort to 99% of the time and it is a standard square 5 1/2 x 5 1/2" card. For this card I got ambitious and layered pumpkins together from the Autumn/fall Digi Stamps and coloured them up with my copic markers. All of my papers come from the Halloween/Autumn Paper Heaven 1 and the Paper Heaven 2. Julie -- Persistence pays off! I’ve been wanting on this team for a long time now. I finally wore Nikky and the talented Polkadoodle ladies down, and here I am! I’ve been doing the happy dance for days now. I’m so pleased to be here. 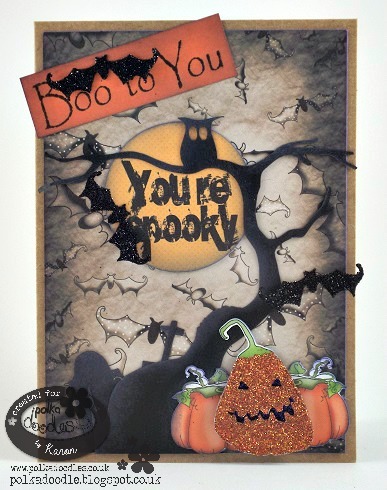 I love shaped cards in any variety, but one of my favorites these days can be found in the Polkadoodles store here. The card shape is the Elegant Card Shape 2 cutting file. The "scary" witch is Amelia Witch Toad. I colored her with Copic markers, then inked the edges with distress ink. 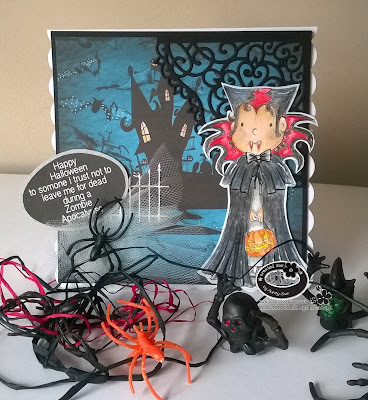 The papers are from the Halloween/Autumn Paper Heaven 1- Digital Download Bundle. The sentiment tag is from the Witchie Witchie 2013 Craft Download Bundle. You have won $10 of downloads from the store - well done! Please contact us HERE and quote PD40001Wk37 to claim your prize. Well done everyone and thanks so much for joining in - and don't forget your badges! !